Get off the couch and exercise while watching TV. Stay in tip-top shape by following a regular exercise routine. 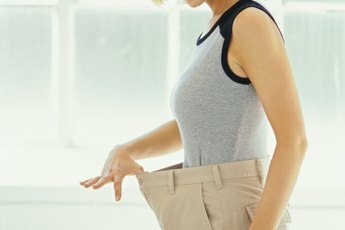 Not only will you fit into those cute clothes you just bought, but you’ll also bust stress and anxiety, regularly be in a better mood, increase your focus at work, feel better about yourself and have extra energy to take on the day. It doesn’t have to be overly difficult to exercise regularly – following a few tips can make it more manageable. It’s hard to find time to exercise when you’re dreading it. Instead of slogging through another treadmill session, find an activity you enjoy and do it as much as possible. The possibilities for cardiovascular exercise are endless – take a dance class, whether it’s ballet or pole-dancing, hop on your bike and go for a ride or join a game of basketball at the local park. Finding a friend to be your workout buddy also makes the task less painful – it’s much more enjoyable to go for a long walk when you’re catching up on last week’s gossip. 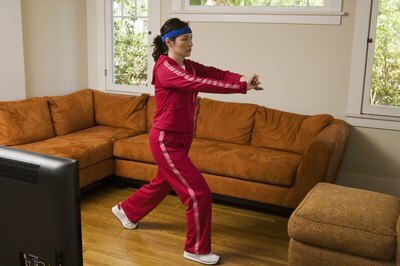 Rather than miss your favorite TV show for another gym session, take your workout to the living room. Position your favorite piece of at-home exercise equipment in front of the TV to bump up your cardio while following the latest soaps, or incorporate strength training into your prime-time favorites. 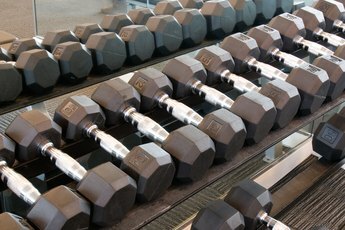 With just one set of 8- to 12-pound dumbbells, depending your fitness level, you can work your upper body with shoulder presses, biceps curls, lateral arm raises, triceps extensions and dumbbell shrugs. In the second half of the show, complete weighted squats, lunges and calf raises for a lower-body workout. If you start an exercise routine with an all-or-nothing frame of mind, it’s easy to burn out quickly. Instead, start slowly and make one change at a time. If you’ve never exercised in the past, it’s much more doable to commit to taking a 10-minute walk two or three times a day than it is to do a full-body cardio and strength-training session daily. While you can work up to a more-intense exercise goal, be realistic during the first few weeks and months of exercise to simply build a habit of moving more. When you feel ready, combine strength and cardio into one session to save time. Hold a 3- to 5-pound dumbbell in each hand and walk on the treadmill at a brisk speed for a warm-up. Hop off the treadmill and complete one minute of strength movements, such as shoulder presses or triceps kickbacks, and then walk for another three to five minutes. Complete these intervals five to six times, targeting different muscle groups, for a full-body interval workout. Complete the series two to three times per week. Not only is a healthy diet a vital part of staying in shape, but a solid nutritional program is vital to properly fuel your workouts. Avoid excess sugar, solid fats, refined grains and salt; instead, fill up on vegetables, fruits, high-fiber whole grains, lean protein such as seafood and low-fat dairy products. Resist the temptation to cut carbs to lose weight – it’s what creates the glycogen stores in your muscles that keep you going during a workout.